i-Mate JAQ Windows Mobile Smartphone - Rebadged HTC Excalibur? Those familiar with i-Mate know that they re-badge and re-brand HTC phones into i-Mate ones. 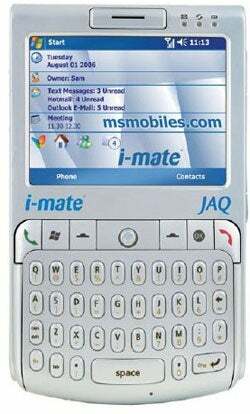 Despite naming them horrible names like the i-Mate JAM, i-Mate KJAM, and now the i-Mate JAQ, their phones actually sell fairly decently to Americans who can't wait to get the latest Windows Mobile 5 technology. Now, i-Mate has the JAQ, which looks to us to be a re-branded HTC Excalibur, but the specs don't match quite up. Sure, they both have the TI OMAP850 200MHz processor, but the JAQ has a 2.8-inch screen compared to the 2.4-inch stated on HTC's roadmap for the Excalibur. The button layout is also a little bit different, with vertically elongated keys and a horizontal layout for the call row. Other features after the jump.